AKC Ohio Breeder for show and loving family homes! Our Toy Poodles and puppies are respected family members living in our home. We are fascinated by the grace, beauty and intelligence of the poodle. Each of our adults, as well as our puppies, are individuals with his or her own likes and dislikes. Exposing our puppies to everyday life is something we feel very strongly about. It shows in the personality and disposition of our courageous babies. We raise our "kids" by our sides with the freedom to play, run and explore inside and outsides of our home. The Brown puppy above is exploring springtime and the wonderful outdoors. Our puppies begin going out to potty at 7 weeks of age and learn quickly to prefer the outdoors to do their business. Then they are given ample time to explore and become acquainted with the world around them. Highly socialized puppies make great family pets! 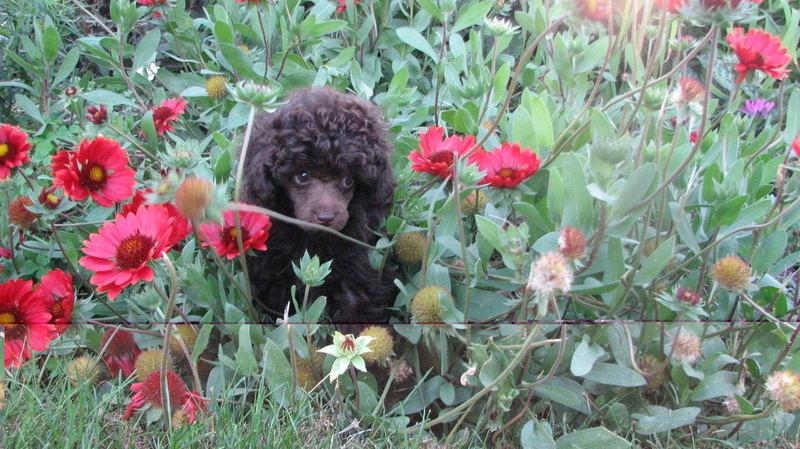 Our commitment is to raise only AKC Registered, well bred, Health Certified Toy Poodles. Every puppy is loving, friendly and a has already been a playful companion to us and the other poodles before arriving to your home. Potty training and Crate training for night time is provided. A well trained puppy is a happy puppy.